The need for fuel generated by renewable resources has become important in the global scenario. Solar energy is an abundantly available renewable resource for the earth. There is a huge potential for H2 derived from clean energy resources for commercial applications such as generation of electricity, fuel for transportation, domestic usage, rocket propulsion, etc. With H2 as a fuel, a zero-emission process using fuel cells produces electricity with only water as the by-product. Global demand for hydrogen (H2) as an energy carrier is steadily increasing. Researchers are therefore working towards the development of efficient materials for hydrogen (H2) production by solar photocatalysis. For efficient H2 fuel production, development of novel/modified photocatalysts that are efficient, stable and recyclable remains a challenge. Titanium dioxide (TiO2), with a band gap of 3.2 eV and suitable band potential, has demonstrated efficient H2 production under UV light irradiation. Significant research had been carried out to modify TiO2-based photocatalysts for enhanced H2 production under UV light and solar/visible light irradiation since in its pure form, it can absorb only UV light (<5% of solar light). This chapter briefs and summarizes about the recent works on the photocatalytic hydrogen production of highly stable TiO2-based heterostructured photocatalysts. 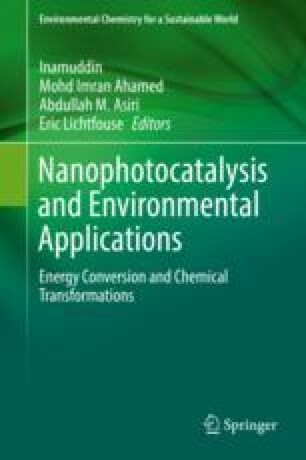 This book chapter also aims to concentrate on three important characteristics: (a) UV-active TiO2-based photocatalysts, (b) visible active TiO2-based photocatalysts and (c) the effects of various carbon nanostructures on the photocatalytic hydrogen production efficacy of TiO2-based heterostructured photocatalysts.